I love the rough surface of the cotton canvas by Talens. 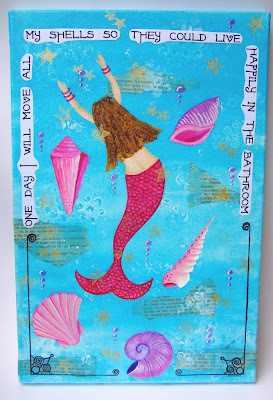 I love placing more and more layers of paint, crayons, scraps, stamps. I love shading which results in the shapes emerging in front of my eyes. I love getting a sudden idea for a painting. I love the smell of a varnish (I know, it stinks like hell!...). I love the fact that I'm doing it with NO initial purpose to sell my paintings. I love the fact that I may put them up for sale, if I choose. I love to make something and not to judge the outcome. I love the variety of ways in which I can express my ideas through painting & collage. ooo what a beautiful picture! You did a great job on the shells, the details are good.